Having opened their internet doors in 1999, Keen has celebrated their thirteenth anniversary as a San Francisco based company. Founded by a psychic, their prime mission is to empower people. They do that through chat, email, and phone based psychic advice sessions. Through the years, their business has grown massively. Ownership has changed, giving a revitalized Keen more substantial backing. Through all of this, customers have remain pleased. Keen has logged millions of psychic reading sessions. Keen's advisors range from natural intuitives to spiritual advisors. Yet, they reach beyond traditional spiritual advice. Advice is available regarding feng shui, Mayan astrology, and even life coaching. Community confidence is important at Keen. They offer good incentives, which allow for risk free testing. Plus, they back up their offers with safety, in the form of confidentiality, security, and financial guarantees. An interesting aspect of Keen is that their advice goes further than many traditional psychic service providers. They offer everything one would expect, of course. That includes psychic readings, astrology readings, tarot readings, psychic mediums, dream interpretation, and more. Here's where they go beyond the norm. A few of their additional offerings are feng shui advice, counseling and therapy, life coaching, health and wellness advice, relationship advice, and Mayan astrology information. Ultimately, they're an exceptionally well rounded service. It's no wonder they use the slogan, “Your Personal Advisor.” They're more like personal advisors who balance all aspects of life, rather than a psychic consultant that advises in limited areas. They advise on many aspects of existence. The satisfaction guarantee from Keen is generous. They'll credit a wronged customer up to $25 for an unimpressive experience. The credit can be used to consult with another advisor. 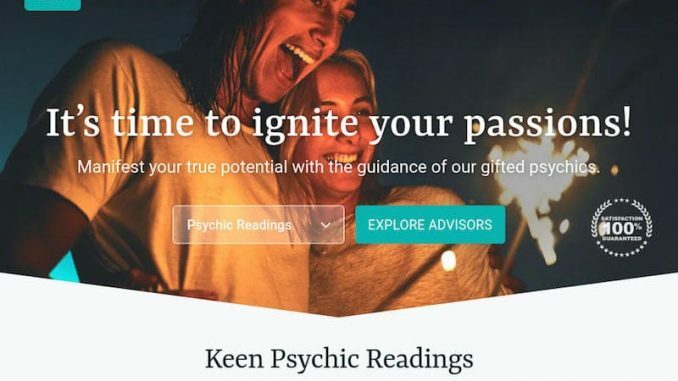 More impressive is that they want customers to leave accurate feedback for each psychic, even when they've had a lackluster experience. To be honest, most companies would not be as eager to have such information posted. Perhaps this is Keen's way of letting customers know that they're committed to doing the right thing. Honesty helps the entire community. It's simply the right thing to do. Keen's site has a clean layout. It's easy to navigate, even for internet newcomers. Daily horoscopes are free of charge. A large selection of articles are free to all readers. Topics include love revelations, psychic discoveries, tarot prophesies, spiritual inspiration, and astrological illumination. There are a couple of ways to search for advisors. Start with the five big tabs across the top of the page. Click on the “Get Advice” tab. Various categories will display, allowing customers to narrow down their choice of advisors right away. The popular categories are psychic readings, love and relationships, life questions, tarot readers, spiritual readings, and psychic mediums. If that's not enough, click on “Show More.” An second way to start out on the website is to click on the “Psychic Readings” link, just below the five big tabs, on the home page. Featured advisors will be shown first. Clicking on “All Psychic Advisors” will bring up many more. At this point, sorting possibilities come into play. Tabs allow sorting between advisors who are available for phone readings or for chat consultation. Clicking on the “Refine My Options” tab allows filtering further by customer rating, availability, and price. Each advisor has a profile page. From this page, the advisor's rate, methods of contact, and availability are shown. If a particular psychic advisor is busy at the moment, it's possible to schedule a call back. Pricing is variable between advisors. It pays to shop around within Keen. Test a few of their advisors. Price may not be the only indicator of their value. Look for advisors who include a relevant biography, which explains their abilities and discusses the methods of divination that they employ. Check to see if the advisor has a blog at Keen. Their blog postings often give away important subtleties, which can help in the decision making process. Potentially, the most useful aspect of the profile page is the customer feedback. Customer feedback is substituted for a screening process at Keen, and it seems to be very effective. Each customer is encouraged to leave not only a star rating, but a written comment about their experience. Having this feedback helps sort out the most effective advisors quickly. An important feature of the feedback is that it is dated. The date helps when trying to understand whether a low rating may be skewed. Did the advisor have a few bad days out of an otherwise stellar run, or are they simply not very accurate at all? The best deal on offer right now is for new customers. When registering, new customers are offered three free minutes of consultation with an advisor. Those three minutes allow new customers to get a feel for Keen, without diving in too deeply. To maximize those minutes, have questions in mind in advance. Spend a little time getting ready before the call. Jot down the really important aspects that must be covered. Being organized and sticking to the high points can help get the advisor settled into the session more quickly. Existing customers are sometimes offered free minutes from the psychic advisors they consult with regularly. Follow Keen on Twitter for other promotions. There are some promotions reserved for registered customers, who are notified of specials via their account. Keen was originally created by a psychic. Over the years, Keen has evolved. They've kept their role of spiritual guide, but they do more now. It's hard to pigeon hole them. They're almost too big to fit neatly in with others in the psychic service industry. They offer more types of advice for living life. Life coaching, counseling, and relationship advice are serious tools that can change lives. It's no wonder many customers develop long term relationships with Keen. There's something comforting about finding everything one needs in one place. Strong respect for customers, a policy of confidentiality, and tight security just make a very good thing even better. Last updated on Friday April 5, 2019.